Kazembe Bediako, the electrifying new voice in urban historical suspense fiction, delivers his second explosive novel – Behutet: The Defeat of the Sebau, Vol. II -filled with heart-stopping action as Ra Heru Khuti, in his ancient warrior form, travels through time to fulfill his divine plan and avert a world disaster. A deadly secret lies buried beneath the red desert sands in ancient Kamit. Ra Heru Khuti must uncover the deadly secret to prevent the evil genius, Mortimer Sethe, from awakening and re-entering the world of man. The story takes place in three ancient cities, Menefer, Avaris and Khmun, amidst a historic vernal eclipse that covers the world with darkness for days. Sethe seizes the moment of darkness to unleash his Sebau creatures to spread confusion and terror as they attempt to establish the New World Order of the Sethian Confederacy and destroy the holy city of Bambalasaam. But all is not lost. 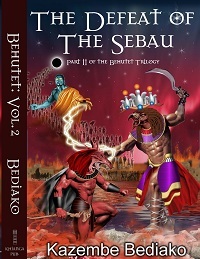 Book two of the Behutet trilogy, Behutet: The Defeat of the Sebau, tells the story of how Ra Heru Khuti triumphantly succeeds in overthrowing Sethe and takes control of his throne through the re-awakening of Ausar in the world. The Behutet Trilogy is an urban Kamitic genre – a true blend of the ancient with the present where dynamic characters transcend time. The Behutet Trilogy skillfully creates a new genre integrating Kamitic cosmology into contemporary lifestyle. A must-read! The book retails for $19.99 in the US, $21.00 in Canada and £14 in the UK and is available at discount rates for the first few weeks. We ship globally. USA residents can also send a check or money order made out to Khianga Publishing. Please call 917 455-3277 Mon-Fri 10am to 4:30pm EST to place your order by phone. All major credit cards are accepted.